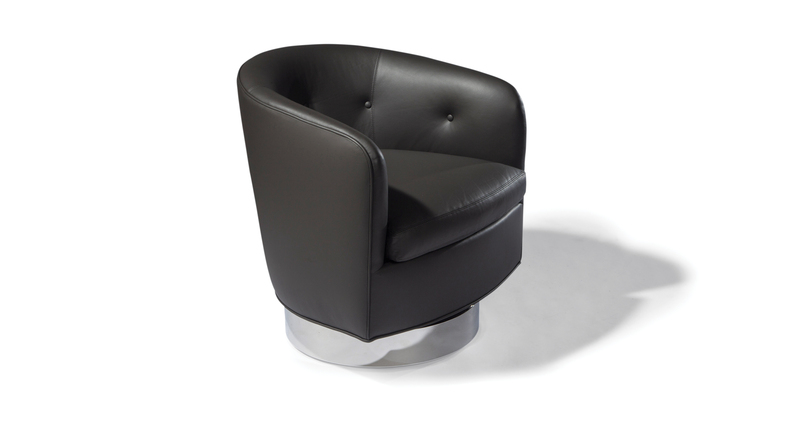 Originally designed in 1965 by Milo Baughman, the Roxy-O swivel-tilt tub chair is a modern classic. Featuring a metal base, button tufting and our unique swivel-tilt mechanism, Roxy-O is a timeless lounge chair for all environs. Select a metal base finish: polished stainless steel (No. 1396-113), brushed bronze (No. 1396-113-B) or satin brass (No. 1396-113-SB), and choose from all our in-house curated fabrics or leathers or provide COM. Also available with an upholstered base as Roxy, a wood base as Roxy Would, or with a metal wrap as Roxy Coat-On. Base available in polished stainless steel finish as No. 1396-113, with a brushed bronze finish as No. 1396-113-B or with a satin brass finish as No. 1396-113-SB.